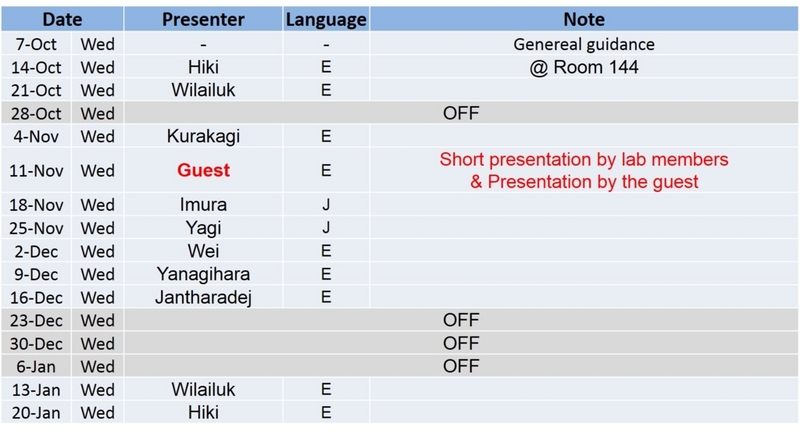 Also in this semester, Lab Meeting will be held to share the knowledge of each student/researcher. All students and researchers in our laboratory are expected to attend this meeting. Clark S.L. et al., 2015, Comparative sensitivity of field and laboratory populations of Hyalella azteca to the pyrethroid insecticides bifenthrin and cypermethrin, Environ. Toxicol. Chem., 34(10), 2250-2262. Palma P. et al., 2016, Ecotoxicological endpoints, are they useful tools to support ecological status assessment in strongly modified water bodies?, Sci. Total Environ., 541, 119-129.
Cooper C.A. et al., 2013, Influence of salinity and dissolved organic carbon on acute Cu toxicity to the rotifer Brachionus plicatilis, Environ. Sci. Technol., 48, 1213-1221. Li H. et al., 2015, Effects of Tris (1,3-dichloro-2-propyl) Phosphate on growth, reproduction, and gene transcription of Daphnia magna at environmentally relevant concentrations, Environ. Sci. Technol., 49(21), 12975-12983. Campana O. et al., 2012, Sub-lethal effects of copper to benthic invertebrates explained by sediment properties and dietary exposure, Environ. Sci. Technol., 46, 6835-6842. Bhattacharjee A.S. et al., 2015, Bacteriophage therapy for membrane biofouling in membrane bioreactors and antibiotic‐resistant bacterial biofilms, Biotechnol. Bioeng., 112(8),1644-1654. Pavlaki M.D. et al., 2014, Changes of chemical chronic toxicity to Daphnia magna under different food regimes, Ecotoxicol. Environ. Safety, 109, 48-55.
de Boer T.E. et al., 2015, Combined transcriptomics analysis for classification of adverse effects as a potential end point in effect based screening, Environ. Sci.Technol., 49(24), 14274-14281. Taylor N.S. et al., 2016, Predicting chronic copper and nickel reproductive toxicity to Daphnia pulex-pulicaria from whole-animal metabolic profiles, Environ. Pollut., 212, 325-329. Piggott M.P., 2016, Evaluating the effects of laboratory protocols on eDNA detection probability for an endangered freshwater fish, Ecol. Evolution, 6(9), 2739-2750. Lee S., 2016, Crossing the Border between Laboratory and Field: Bacterial Quorum Quenching for Anti-Biofouling Strategy in an MBR, Environ. Sci. Technol., 50(4), 1788-1795.
de Haas E.M. et al., 2004, Combined effects of copper and food on the midge Chironomus riparius in whole-sediment bioassays, Environ. Pollut., 127(1), 99-107. Halpern B.S. et al., 2012, An index to assess the health and benefits of the global ocean, Nature, 488(7413), 615-620. Wold S. et al., 2001, PLS-regression: a basic tool of chemometrics, Chemometrics Intell. Lab. Systems, 58(2), 109-130. Burgess R., 2001, An improved protocol for separating meiofauna from sediments using colloidal silica sols, Mar. Ecol. Prog. Ser., 214, 161-165. Yates E.A. et al., 2002, N-acylhomoserine lactones undergo lactonolysis in a pH-, temperature-, and acyl chain length-dependent manner during growth of Yersinia pseudotuberculosis and Pseudomonas aeruginosa, Infection and Immunity, 70(10), 5635-5646. Barnes M.A. et al.,2014, Environmental conditions influence eDNA persistence in aquatic systems, Environ. Sci Technol., 48(3), 1819-1827. Nye J.A. et al., 2013, The relative impact of warming and removing top predators on the Northeast US large marine biotic community, Ecol. Modelling, 264, 157-168.